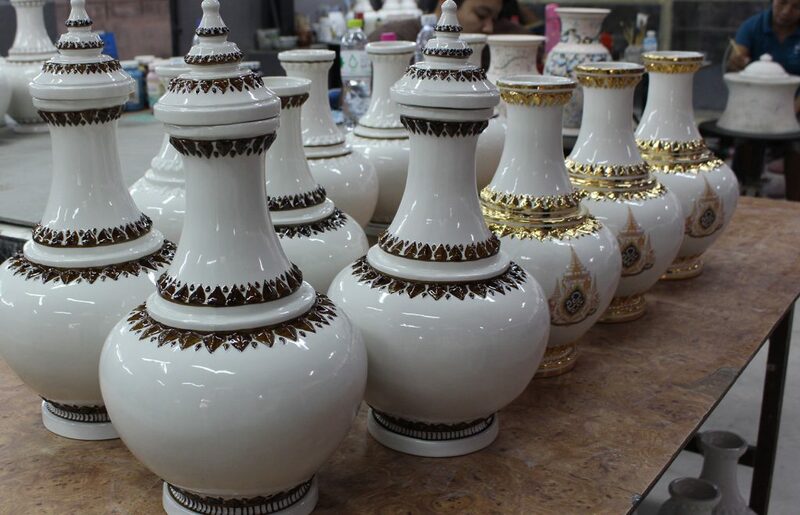 Ratchaburi – A ceramics company based in Ratchaburi province has prepared the holy water vessels to be used in the royal coronation ceremony of His Majesty King Maha Vajiralongkorn. Deputy Governor Weerat Prasetho was on hand to inspect the vessels, which will carry holy water used in the ceremony. The holy water vessels are being produced by Rattanakosin Ceramic 4 Co., Ltd., based in the capital district. A total of 67 vessels are being transported to the Ministry of Interior, with all 125 vessels expected to be completed by the end of March. Sukchat Khosabodi, owner of Rattanakosin Ceramic 4, explained that each piece, once sculpted and polished, must air dry for 3-5 days. Then they enter the kiln at 900 degrees Celsius, after which further details and royal emblems are added.